Erik Martin, whose pen name is E.Scott Martin, will discuss the process he went through in order to get his book written and published at the Greenville Public Library’s Author Sign & Share. GREENVILLE – The Greenville Public Library will host author E. Scott Martin at its next Author Sign & Share at 6 p.m. Nov. 1. This event is always held in the Reference Room on the second floor, and registration is not required. 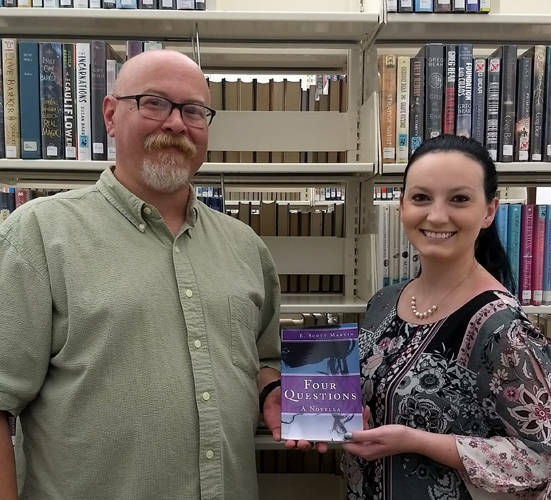 Erik Martin is a reporter for The Daily Advocate and has released his first book, “Four Questions: A Novella.” Martin, whose pen name is E. Scott Martin, will discuss the process he went through in order to get his book written and published. A book sale and signing will follow the presentation. Martin graduated from Huntington University with a Bachelor of Arts in English in 1994. Prior to his work for The Daily Advocate, he worked as editor of Coin Values Magazine and as a writer for Coin World Magazine. He currently resides in West Milton with his wife and two children. When asked what primary message should readers take away from “Four Questions,” Martin said it is the idea that common people can accomplish big things, through determination and a little luck.